A great product starts with a great design. Original equipment manufacturers (OEMs) are continually striving to make innovative devices, machines, and equipment, but the end product might not always work as intended. A new product can produce too much noise, vibration, or heat and need to return to the drawing board before hitting the market. Sometimes, manufacturers learn that their new product has difficulty operating in hot, cold, or damp environments. It is frustrating and expensive to have to go back and fix a product with energy management issues. What if you could prevent problems from occurring by designing with noise, vibration, and thermal control in mind using molded foam? Molded solutions may not be right for every project, but OEMs should understand the options available to them so no one has to go back to the drawing board. Custom foam can be engineered to fit the unique specifications of projects in a variety of industries and ensure that the final product hits the mark. A successful product not only looks great but operates smoothly. To make sure your latest product has the expected functionality, it’s time to be bold and consider how a molded polyurethane foam could be used in the initial concept of a design. By thinking forward, Polymer’s Molded Products division (PMP) helped an OEM of heavy trucks improve their equipment using molded foam. The manufacturer came to Polymer Technologies because their engines would freeze and stop working in subzero temperatures, leaving drivers stranded. The truck manufacturer initially chose a 2D cut foam material before upgrading to a 3D molded foam solution. The cut foam pieces worked to insulate the interior compartment of the engine, but applying the foam by hand was time-consuming and expensive at high volume production. By developing a custom 3D molded foam solution, the foam-assembly snapped into place, providing precision thermal insulation at the source. Molded polyurethane foam fits perfectly in place to stop excess noise, vibration, and heat. The world is unpredictable, but when designers work with 3D molded foam solutions in mind, they can knock out potential energy management problems before they become an issue. Find out how being bold and starting to Think Forward about the possibilities of molded foam can impact your production by reading the truck manufacturer’s success story. 2D and 3D foams are great for solving energy management problems. Both provide low-weight, highly resilient solutions that prevent or mitigate excess noise, vibration, and heat issues. 2D and 3D foam materials can also be cut or molded into unique shapes and formulated with different chemistries to meet manufacturer requirements. Depending on your application and project goals, one type of foam material might perform better than the other. The major difference between the two types of foam is that 3D molded foam provides a more precise energy management solution. While 3D molded polyurethane foam can be more expensive to produce initially, it may be more cost-effective for assembly lines producing thousands of parts. If you are striving to find an innovative way to fill space, create airflow channels, and eliminate PSA, screws, hooks, and fasteners, a molded solution could be exactly what you’ve been looking for. 2D cut foam solutions can provide some variety as these materials can be cut into almost any flat shape. However, the time and effort it takes to cut and place cut foam materials is time-consuming and expensive for assembly line operations. Ultimately, both of these materials help solve energy management issues. Check out our 3D molded foam and 2D foam materials to learn more about their applications. To get the most out of your materials, you should consider partnering with a dedicated supplier like Polymer Technologies who can help you develop a custom foam solution. By working with a supplier, you can create high-quality products right out of the gate—no more going back to the drawing board! Now that’s Thinking Forward. When you bring in a dedicated supplier, you’re adding an expert to your team who can help bring your vision to life your way. For example, Polymer Technologies works with your development team to help you determine whether a 2D or 3D foam solution will work best for you. Thanks to our in-house production facilities at PMP, we can develop custom molded foam products to meet OEMs specifications. To make sure your product works as envisioned, we can develop prototypes using expendable molds or cutting and assembling slab-stock foam. Our prototyping process is constantly innovating, using 3D printing services to enable precise part creation during the molding process. If you want to know more about developing a molded solution—ask the molding experts! 3D3D molded foam solutions are incredibly appealing because of the innovative design possibilities they afford manufacturers. While these possibilities are exciting, 2D foam materials shouldn’t be excluded when considering an energy management solution. Cut or flat foam materials are also versatile and capable of tackling a wide range of noise, vibration, and temperature control problems. From thermal insulators for controlling temperature to heat shields to block extreme heat, our thermal insulation foam solutions have you covered. Be in control of extreme temperatures. POLYDAMP® melamine, hydrophobic melamine, and polyurethane foam insulation are great for controlling excess noise and providing temperature control. Enjoy the sound of silence! Easy to install in walls, doors, floors, and ceilings, our acoustical barriers have applications in industries including power generation, construction, medical, and transportation. Our custom vibration damping materials are suitable for use in engine compartments, cab walls, enclosures, floor and ceiling systems, door panels, and more. To increase efficiency and reduce acoustical leaks, we supply POLYTECH® gasket materials made from an array of polymers including PVC, polyurethane, neoprene, silicone, and blends to meet your needs. Our POLYTECH® reticulated urethane foams are ideal for air filtration in a variety of industries including HVAC, medical, and mass transportation. Find the right solution and breathe a sigh of relief. Molded polyurethane foam lets manufacturers be bold with their designs and prevent energy management problems because the material is so versatile! If you are looking for a way to take your design to the next level, it’s time to consider partnering with a dedicated supplier like Polymer Technologies. Between our expert representatives and engineers, we can answer your questions and help you find the right material solution for your project. We believe in being completely transparent because we want to support manufacturers in making bold decisions, breaking the mold, and redesigning their future. Molded foam solutions to prevent noise, vibration, and temperature control problems in the design phase of a compressor. 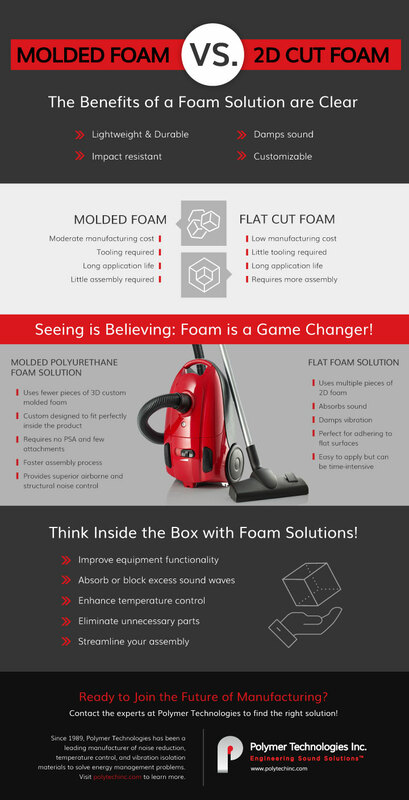 Ready to Start Thinking Forward with Molded Foam Solutions?